Who should not take Migraine Formula? This product is a combination of aspirin, acetaminophen, and caffeine. It is used for the temporary relief of pain from conditions such as muscle aches, toothaches, menstrual cramps, or headaches (including migraine). Aspirin and acetaminophen relieve pain by keeping your body from making certain natural substances. Caffeine helps increase the effects of aspirin and acetaminophen. Take this medication by mouth as directed by your doctor, or follow the product package directions. Drink a full glass of water (8 ounces/240 milliliters) with this medication unless your doctor directs you otherwise. If you are using the tablet form of this medication, do not lie down for at least 10 minutes after you have taken this drug. If upset stomach occurs, you may take it with food or milk. The dosage is based on your medical condition and response to treatment. Do not increase your dose or use this drug more often or for longer than directed. Do not use this product for pain lasting longer than 10 days or fever lasting more than 3 days. Use the smallest effective dose. Consult your doctor or pharmacist for more information. If you are taking this product for headache, seek immediate attention if you also have: slurred speech, weakness on one side of the body, sudden vision changes. Before using this product, consult a doctor or pharmacist if you have: daily headaches; your first headache after age 50; a headache that is more severe or different from your usual headaches; headaches caused by head injury, coughing or bending; a headache with persistent/severe vomiting, fever and stiff neck. Consult your doctor or pharmacist if your migraine headache is not relieved, or if it worsens after the first dose. Consult your doctor if your condition persists or worsens (e.g., new or unusual symptoms, redness or swelling of the painful area, pain or fever that does not go away or gets worse). 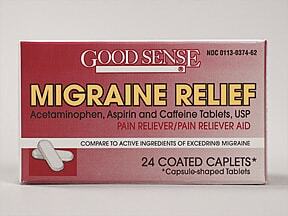 What conditions does Migraine Formula treat? Nausea, vomiting, stomach upset, trouble falling asleep, or a shaky/nervous feeling may occur. If any of these effects persist or worsen, notify your doctor or pharmacist promptly. Stop taking this medication and tell your doctor right away if any of these unlikely but serious side effects occur: severe dizziness, fainting, persistent or worsening stomach pain, vomit that looks like coffee grounds, black/bloody stools, ringing in the ears, loss of hearing, irregular/fast heartbeat, signs of kidney problems (such as change in the amount of urine), signs of infection (e.g., persistent sore throat or fever), easy bruising/bleeding. List Migraine Formula side effects by likelihood and severity. Before taking this product, tell your doctor or pharmacist if you are allergic to it; or to aspirin or other NSAIDs (e.g., ibuprofen, naproxen, celecoxib); or to other salicylates (such as choline salicylate); or to acetaminophen; or to caffeine; or if you have any other allergies. This product may contain inactive ingredients, which can cause allergic reactions or other problems. Talk to your pharmacist for more details. This product should not be used if you have the following medical condition: aspirin-sensitive asthma (a history of worsening breathing with runny/stuffy nose after taking aspirin or other NSAIDs such as ibuprofen, naproxen). Before using this medication, tell your doctor or pharmacist your medical history, especially of: asthma, certain blood disorders (e.g., anemia), bleeding or blood clotting problems (e.g., hemophilia, low platelet count), ulcers, gout, poorly controlled diabetes, kidney or liver disease, growths in the nose (nasal polyps), anxiety disorders, insomnia, heart disease (e.g., arrhythmia), high blood pressure, stomach problems (e.g., heartburn, upset stomach, or stomach pain) that do not go away or persist. Consult your doctor or pharmacist for information on safe use of this product. This medicine may cause stomach bleeding. Daily use of alcohol and tobacco, especially when combined with this medicine, may increase your risk for stomach bleeding. Avoid alcohol and stop smoking. Consult your doctor or pharmacist for more information. Older adults may be more sensitive to the side effects of this drug, especially stomach/intestinal bleeding and ulcers, liver problems, and trouble falling asleep. Children and teenagers less than 18 years old should not use aspirin, aspirin-containing or aspirin-related medications such as this product for flu symptoms or chickenpox without first consulting a doctor. A rare but serious illness known as Reye's syndrome may occur. Tell your doctor right away if you notice changes in behavior with nausea and vomiting. Aspirin in this product is not recommended for use during pregnancy. Do not use this product during the last 3 months of pregnancy because of possible harm to an unborn baby or problems during delivery. Consult your doctor before using this medication if you are or think you may be pregnant. Tell your doctor right away if you become pregnant while taking this medication. This product passes into breast milk and may have undesirable effects on a nursing infant. Consult your doctor before breast-feeding. What should I know regarding pregnancy, nursing and administering Migraine Formula to children or the elderly? This drug should not be used with the following medications because very serious interactions may occur: ketorolac, mifepristone. If you are currently using any of these medications listed above, tell your doctor or pharmacist before starting this product. Before using this medication, tell your doctor or pharmacist of all prescription and nonprescription products you may use, especially of: acetazolamide, cimetidine, corticosteroids (e.g., prednisone), ketoconazole, methotrexate, certain medications for gout (e.g., probenecid, sulfinpyrazone), anti-seizure drugs (e.g., phenytoin, valproic acid), vemurafenib. Consult your doctor before using this product if you have recently received certain live vaccines (e.g., varicella vaccine, influenza intranasal vaccine). Check all prescription and nonprescription medicine labels carefully since many contain pain relievers/fever reducers (acetaminophen, aspirin, or NSAIDs such as ibuprofen, celecoxib, naproxen) and if taken together with this product, may increase your risk for side effects. However, if your doctor has directed you to take low-dose aspirin for heart attack or stroke prevention (usually at dosages of 81-325 milligrams a day), you should continue taking it unless your doctor instructs you otherwise. Ask your doctor or pharmacist for more details. This drug may affect certain medical/laboratory tests (e.g., certain urinary sugar tests, dipyridamole-thallium imaging tests). Make sure laboratory personnel and your doctors know you are taking this medication. Does Migraine Formula interact with other medications? If someone has overdosed and has serious symptoms such as passing out or trouble breathing, call 911. Otherwise, call a poison control center right away. US residents can call their local poison control center at 1-800-222-1222. Canada residents can call a provincial poison control center. Symptoms of overdose may include nausea, vomiting, loss of appetite, sweating, burning pain in the throat and stomach, stomach/abdominal pain, extreme tiredness, yellowing eyes/skin, ringing in the ears, rapid/shallow breathing, irregular/fast heartbeat, change in the amount of urine, dark urine, confusion, agitation, seizures, loss of consciousness. If you use this medication regularly for a long time or at high doses, laboratory and/or medical tests (e.g., liver and kidney function tests) may be performed to monitor for side effects. Consult your doctor for more details. Because this product contains caffeine, taking it close to bedtime may give you trouble falling asleep. Limit the use of caffeine-containing medications, foods, or beverages while taking this product. If you take too much caffeine, you may become nervous or irritable, have trouble sleeping, or have fast heartbeat. If you are taking this product for headaches, it is best to avoid certain foods that may trigger your headaches. Lifestyle changes such as stress reduction programs, exercise, and dietary changes may help prevent headaches. Talk to your doctor or pharmacist about lifestyle changes that might benefit you. If you take this medication regularly and miss a dose, take it as soon as you remember. If it is near the time of the next dose, skip the missed dose and resume your usual dosing schedule. Do not double the dose to catch up. Do not flush medications down the toilet or pour them into a drain unless instructed to do so. Properly discard this product when it is expired or no longer needed. Consult your pharmacist or local waste disposal company for more details about how to safely discard your product.Information last revised January 2018. Copyright(c) 2018 First Databank, Inc. This medicine is a white, oblong, tablet imprinted with "L374". 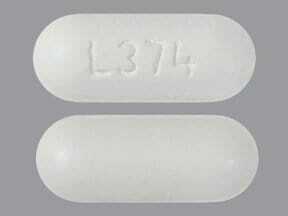 This medicine is a white, oblong, coated, tablet imprinted with "L374". Have you ever purchased Migraine Formula?